Wholesale used vehicle prices (on a mix-, mileage-, and seasonally adjusted basis) increased 2.6% month-over-month in May. 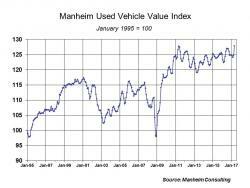 This brought the Manheim Used Vehicle Value Index reading to 127.9, which was a record high and represented a 2.8% increase from a year ago. On a year-over-year basis, the mid-sized car category saw the largest decline (down 2.4%) in May, while pickups and vans saw gains greater than the overall market. The May index result challenges concerns that increasing wholesale supplies from near peak off-lease volumes and rising rental volumes would lead to rapidly declining used car values. Indeed, the opposite appears to be happening. Higher commercial volumes at auction are providing the used vehicle market with quality and choice that offers a compelling value to consumers. Dealers responded to the consumer demand for used vehicles by purchasing the most vehicles at Manheim for the month of May since 2008. Year-over-year growth in sales outpaced the growth in inventory, which helped result in the record high index value. A slightly younger mix of vehicles also likely contributed to the record index level. New vehicle market continues to struggle in 2017. Franchised dealers have had more than 4 million new units in stock for the last four months. The May new sales volume slipped 0.5% year-over-year even with one extra selling day compared to May 2016. New vehicle sales year-to-date are down 2% compared to last year. Combined rental, commercial, and government purchases of new vehicles were down 15%, due primarily to a sharp decline of new sales into rental (down 24%). Retail sales were up 3% in May, helping push retail sales into slightly positive territory for the year (+0.1%). Used CPO sales strengthened in May. Registration data indicate that used vehicle sales were weak in the first quarter, but wholesale buying trends and CPO sales in May point to improving momentum. CPO sales ticked up sharply in May (+7%) leading to a year-to-date gain of 1.6%. CPO sales of light trucks jumped 16% as increasing SUV/CUV/pickup inventory coming off-lease is lining up well with consumer demand. The passenger car share of CPO sales came in at 49% for May, as SUV/CUV/pickups began to dominate just as they have since 2013 in the new vehicle market. Rental risk pricing eases on higher volume. The average price for rental risk units sold at auction in May was down 2% year-over-year; rental risk prices were down 1% compared to April. SUV/CUVs accounted for 29% of rental risk sales in May of this year versus 25% last May. Compact cars’ share fell from 31% to 27%. Average mileage for rental risk units in May (at 38,900 miles) was 9% below a year ago. Low unemployment, rising wages, and high confidence keep retail demand strong. Consumer confidence remains near a 16-year high, according to the May data from the Conference Board. Consumers remain positive about the economy due to strong labor conditions that are resulting in earnings’ rising faster than inflation. Likewise, stock indices and home prices continue to support growth in household wealth. The unemployment rate in May fell to 4.3%, a 16-year low.